Updated Wednesday 30th October 1996. As an 'UPDATE' to the articles: 'TWO VIEWS OF THE SAME FRACTAL', Kris and I would like to submit the following observations. ARC: 'Julia Set' like arc of the Windmill Hill formation. SUB TOTAL: Total number of circles of main arc. TOTAL: Total number of circles of main arc+side sets. GRAND TOTAL: 197 circles, including the large centre circle. Arc A has 19 'Tail' circles, or, two more than Arc B, and Arc C. Could this be another musical 'Repeat Mark' reference? Arc A also has 32 side set circles, the same number of circles forming Arc B without side set circles. An original aerial photograph shot by Steve Alexander. UK Tel: (01705 352867) Copyright 1996. The Windmill Hill formation has off-centeredness, a feature it shares with the 'Double Helix and 'Julia Set' designs. Arc B has an extra 'Spine' circle, making 12, the same number of spine circles forming the 'Double Helix'. Arc B has 34 side set circles, the same number of circles forming the 'Julia Set' spiral ('Coda' to 'Tail'). B) Tangential geometry everywhere! Including, from 'Tail' to 'Tail'. c) And what looks like a geometric sizing and spacing of elements. The spiraling arms of the Windmill Hill formation are in a clockwise direction, while the Julia Set spiral is in an anti-clockwise direction. The Windmill Hill agriglyph even looks like a 'Windmill' (i.e. : One of those three cornered, plastic toy windmills (a 'pinwheel'), found at any seaside resort, alongside plastic spades and sandcastle buckets. A) The Double Helix seems to symbolize a planet/moon system (perhaps the sun Earth/Moon system), showing the 'Apogee' (furthest) and 'perigee' (nearest) positions of a moon as it orbits a moving planet. B) The Julia Set seems to symbolize a star/planetary system (perhaps the sun and planets of our solar systems) moving around a galactic center. C) The Windmill Hill formation seems to symbolize a spiral galaxy. A) The dynamics of large centres of mass around a common centre in space. 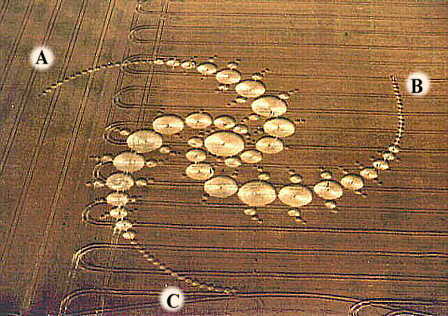 B) The possibility that 'Astrophysics' (Known 'Cosmic forces) may have a significant part to play in the creation of some crop circles, i.e. : The Double Helix/Julia set formations. C) Our on going research into the subject, and to be thoughtful about what might appear next in the fields of England. Pages 1-4 of Kris' article were completed on July 26th 1996, and mailed to various Crop Circle reporting magazines, in the US and UK, on July 29th 1996 before learning about the Windmill Hill formation. A COINCIDENCE? OR, COSMIC CLUE?